When it comes to succeeding online you know that getting traffic is key. After all, more visitors means a bigger mailing list, more chances to serve and more sales too. But GETTING the traffic can be the tricky part. So I've embarked on an adventure to test various traffic sources and report back to you, my loyal readers. A couple of weeks ago I took the first steps in that experiment by uploading a slide presentation to Slideshare. The results have been interesting. This is Part 3 of a multi-part series of articles. In part 2 I shared some observations about the traffic we were receiving as well as understanding Slideshare's analytics. If you like what I am writing please consider sharing it on Twitter. Am loving this 3 part series on FREE TRAFFIC from the owner of the Directory of Ezines! Over the past few weeks I have received the same question time and time again. What RESULTS have you seen from this experiment? Here is an image showing my total views during the last few weeks. I believe these are people that I would not have reached in other ways. In my book having about 2000 views for zero cost is a win. I'll take that every week please. But are "views" the same as new people learning about me for the first time? It turns out - not so much. BUT ... the news on the never-heard-about-Charlie numbers is pretty dang good in its own right. Here's an image to show you what I mean. These numbers tell me that people are viewing the Slideshare more than once! And that is both good and bad at the same time. Good that they want to return. Not as good as in maybe my presentation is a little long or could be easier to understand. Only time, and more experimenting, will tell. But DO notice this. In the red box below you will see how many people viewed my presentation on Slideshare vs. viewing it on my blog. 461 is, to me, a good number. Remember, you don't need HUGE numbers of visitors. You just need to engage the ones who come. And our little company has learned to do that well. And now to the last result for today. If you know me, you know that I love building my list, delivering high-value free content and making friends (and customers) via email marketing. So you won't be surprised to learn that I was watching our list building like a hawk during this experiment. 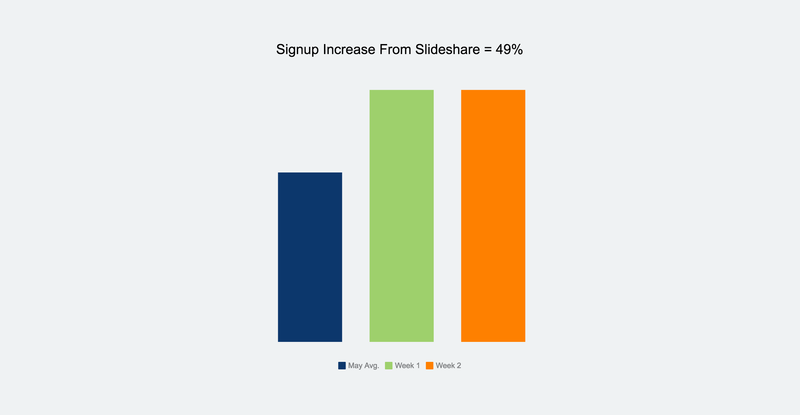 RESULT 2 - OUR LIST BUILDING INCREASED BY 49% DURING EACH WEEK OF THE SLIDESHARE TEST! 49% is nothing to sneeze at. Which is why I wondered if it was a "first-week" phenomenon or if it could possibly keep up. And then I saw the results for week 2. ANOTHER 49% increase. Here is the chart I keep on this. I am figuring the increase at 49% compared to our average weekly growth in May 2016. For me, this is no-brainer. I HAVE to be on Slideshare more and more. I know enough about marketing online to know that doing more of a thing that is working, instead of moving to something else, is how big businesses are built. Doing more of a thing that is working, instead of moving to something else, is how big businesses are built. In the final part of this series, I will share how I came up with the idea, how long it took and which tools were most helpful. It's going to be good news because YOU CAN DO THIS! And if you do, you too can reach a new audience, get free traffic, build your list faster ... at all NO cost! you did it again, another great blog post.So much info and easy to understand. I’m going there now to have a go at Slideshare. Thanks Mark. I think you will love what Slideshare can do for you. Are you using the free or paid version of slideshare? I upload blog posts I repurpose into PDFs using the free version so the links in the doc are not live and I don’t get many views although more than other doc sharing sites. By the way, LOVE the video about the YouTube Director App. Downloading it now! Thank you for such great content.